Oswin Oswald is introduced in the first episode of the seventh series, "Asylum of the Daleks". 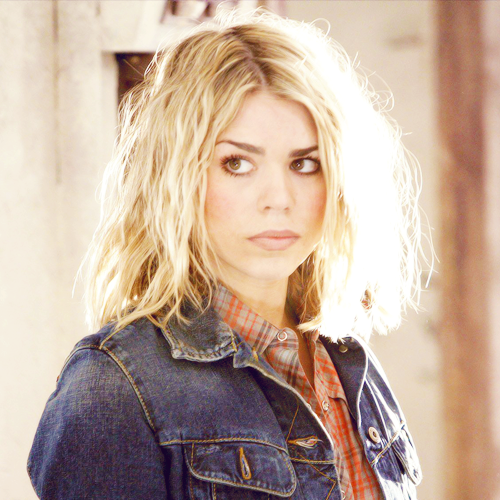 She is the sole survivor of the Starship Alaska, which crashed on the Asylum, a prison planet for insane Daleks. The Doctor plans on rescuing her, but discovers she has been converted into a Dalek, and has coped by retreating into a fantasy of her own survival. Oswin assists the Doctor and his travelling companions in escaping the planet unharmed, but at the cost of her own life. It is later revealed that Oswin is a split version of Clara Oswald. Polly (possibly Polly Wright, although no surname is used onscreen) is a fairly upper-class young woman in the 60s, working as secretary to Professor Brett on his WOTAN project, during which she's hypnotised by WOTAN. Afterwards, in company with Ben Jackson, a c0ckney sailor with whom she's developed a friendship, she inadvertently gets whisked off in the TARDIS. During her stay, she battles Cybermen, Daleks and Macra, among others, eventually being returned to the exact day of her departure. Polly and Ben have a very "opposites attract" relationship, and seem close even though they're constantly quarrelling. Ben usually calls Polly "Duchess". Nothing is known of what happened to them after leaving the TARDIS, but in 2010 Sarah Jane suggests that Ben and Polly are running an orphanage in India. Queen of Years was a title given to a chosen female in the Sun-singers of Akhet. The Queen of Years knew all the songs, melodies, rhythms and poems ever written or sung by that culture. The Queen of Years was required to sing to the Mummy, in front of a stadium full of thousands of the natives and residents of the system, in a big millennial event called the Festival of Offerings. After singing, she would be sacrificed. Every time a Queen of Years died, a new one replaced her. During the time when the Eleventh Doctor and Clara Oswald visited Akhaten, a young girl called Merry Galel held the title. She was chosen and taken from her family as a baby, after the last Queen of Years died. Rills were large, scaly creatures. They had powerful skulls with wide mouths and large eyes. They had several pairs of tentacles, including six with human-like hands. They communicated telepathically and were unable to speak vocally. Sara was an earthwoman living around the year 4000 AD, employed as an operative by Mavic Chen, Protector of the Solar System who, unknown to Sara, was a traitor working with the Daleks. Chen tricked her into killing her own brother, Bret Vyon, who had arrived on Earth with the Doctor and Stephen to expose him. The Doctor eventually convinced her of Chen's treachery, and she fled with him in the TARDIS, taking the crucial part of the Daleks' Time Destructor weapon. During her time in the TARDIS, Sara visited 20th century Britain, early 20th century Los Angeles, an unnamed volcanic planet and Old Kingdom Egypt, where the Daleks recovered the missing part. Returning to the Daleks' base on Kembel, Sara helped the Doctor trick them. The Doctor activated the Time Destructor to destroy the Daleks, but Sara, who'd returned to help him, was unable to get back to the safety of the TARDIS and aged to death, eventually crumbling into dust. Terileptils were reptilian humanoids, mostly fish like. Each Terileptil seemed to be of primarily one colour - for example, green, blue or red - but some of their scales and ruffles had variations in hue. They breathed through gills on the side of the head, their hands and feet were like flippers, and their wide mouths were full of pointy teeth. They breathed soliton gas. Utopia was the eleventh episode of the third series of the revived series of Doctor Who. It marked the return of Captain Jack Harkness and notably featured the first televised re-appearance of the Master since 1996's Doctor Who TV movie. This story continued on from the end of the Torchwood episode End of Days, with a six month gap between broadcasts. It also continued in The Sound of Drums leading some, including the DWM survey, to take it as a three part story. However, Russell T Davies himself says he took it to be a separate story from the final 2 parter. Victory of the Daleks was the third episode of the fifth series of BBC Wales Doctor Who. In it, the Eleventh Doctor met for the first time both the Daleks and Winston Churchill, having met each before in past incarnations. Like Daleks in Manhattan before it, it involved the last Daleks in the universe desperately trying to rebuild the Dalek race in a famous period of Earth's recent past. The episode is notable for the colourful redesign of the Daleks. H.G. (Herbert George) Wells, 1866-1946, was a novellist, historian and political thinker, remembered most for his pioneering SF books like The Time Machine and War of the Worlds. He's known to have travelled briefly with the Doctor in his youth, helping him to overthrow the Borad on the planet Karfel. In the process, he encountered the name Morlox which he later used as Morlocks in The Time Machine. It's not known whether he had any further experience with the Doctor, but examination of his writing suggests he was at least familiar with some of the Doctor's previous adventures. In particular, his portrayal of the passive Eloi and the vicious, subterranean Morlocks seems to have been inspired by the Thals and Daleks at the time of the Doctor's first visit to Skaro, while the Martians in War of the Worlds - organic beings in technological travel machines - were probably inspired by the Daleks. Xeriphas was the homeworld of the psychic Xeraphin race. 140 million years BC, Xeriphas was caught in the cross-fire of the Vardon-Kosnax War and devastated by radiation. The fleeing Xeraphin merged into a gestalt and left for Earth. By the early 1980s Xeriphas had returned to normal and the Fifth Doctor said that they could return. The Master ended up trapped there. Yvonne Hartman was the administrator of Torchwood in 2007, prior to the Battle of Canary Wharf. She presided over the long-awaited capture of the Tenth Doctor. Hartman oversaw the projects that included the investigation of the Void Ship, as well as the ghost shift experiments that resulted in the invasion by the Cybermen from an alternate universe. Yvonne, along with Jackie Tyler, was taken to be upgraded. Yvonne stated that she did her duty for queen and country, and walked into the Cyber-conversion unit, where she was then painfully upgraded. Zanak, also known as the Pirate Planet, is apparently a pleasant, prosperous planet, though anyone who questions what's going on is targeted by either its ruler, the Captain, or by the sinister Mentiads. In fact, the planet is hollow and driven by engines that allow it to materialise around other planets and crush both the planet and any population it has, in order to extract the precious minerals. The Captain is, in fact, being compelled by the ruthless, conquest-made Queen Xanxia, but he manages to outwit her, and the Doctor finishes the job, destroying the engines and converting Zanak back into a normal planet that will be ruled by its people. Army of Ghosts was the twelfth episode of the second series of Doctor Who. It marked the first on screen appearance of the Torchwood Institute and the Cult of Skaro, as well as the return of the Cybermen, appearing for the first time in the Doctor's own universe. Dr. Edwin Bracewell was an android modelled after a Scottish human. He was made by the Daleks after they landed in 1941. Bracewell was placed in the Cabinet War Rooms below London as an advisor to Winston Churchill. He was unaware of his origins and was implanted with memories of a human life and the creation of the Daleks as a weapon called an 'Ironside' for Britain. The Chameleon Circuit (also known as camouflage unit and cloaking device) is a feature built into TARDISes built by the Time Lords, although missing from the War Chief's SIDRATs and the Daleks' time machines. It enables the TARDIS to assess the environment it's materialising into and take an external form that will blend in - for instance, an altar in a monastery. It's notable that TARDISes seen on Gallifrey aren't disguised - perhaps the chameleon circuit recognises that disguise is unnecessary there. The chameleon circuit on the Doctor's stolen Type 40 TARDIS is notoriously broken, so that it always takes the form of a police telephone box from the 1960s, a shape it had while parked long term in Foreman's junk yard. The Doctor has occasionally made half-hearted attempts to repair it, most notably early in his sixth incarnation, when it briefly took the form of a pipe organ, a dresser and a gateway, before reverting to its usual shape. On the whole, the Doctor tends to prefer the TARDIS retaining its familiar form. Dame Kelly Holmes Close was a street in Stratford, London. Trish Webber lived there with her daughter, Chloe. In July 2012, an Isolus possessed Chloe and allowed her to cause the disappearance of children living on the street. The street was re-tarmacked for the 2012 Olympic Games. The heat from the tarmac was used to launch an Isolus pod. A planet, also called Sol 3, orbitting a yellow dwarf star in the Orion-Cygnus Spiral Arm of the Milky Way galaxy. Earth is home to at least two intelligent species - homo reptilia, sometimes called Silurians, a biped reptilian race, and the later-developing mammalian race homo sapiens, also called Humans. Earth has seemed, even during its pre-space-age history, to have attracted more than its fair share of alien invaders, such as Daleks, Cybermen, Pyroviles, Carrionites and the Great Intelligence, among many others. During Earth's early years of space travel and broadcasting signals, this intensified, to the extent that, by the early 21st century, there appeared to be several invasion attempts every year. The Doctor has shown a great affinity with Earth and the human race, visiting it probably more than all other planets put together, both by his own choice and by that of the TARDIS. Most of his companions have been from Earth (or in a few cases humans from planets colonised from Earth) and he's treated the planet as his base, or semi-permanent home, on a number of occasions, mostly notably during the 1970s, although his interactions with humans have ranged from the early paleolithic period to billions of years in the future. A fez was a type of brimless hat in the shape of a flat-topped cone. Fezzes were made of felt and typically, but not always, had a single tassel attached to the centre of their flat tops. They were particularly popular in Egypt, judging from the number of times the Doctor encountered fezzes around Egyptians or Egyptian artefacts. It was a popular accessory of the Eleventh Doctor, though also worn by the Seventh. The Doctor has encountered a number of beings believed to be ghosts, though all have actually turned out to be something else. These have included time-travellers from the 22nd century, the Guelph, Cybermen and another time-traveller stuck in a pocket universe. On one occasion, the Doctor and Jo also briefly met their own future selves, which the Doctor speculated were ghosts of a kind. Sarah Jane once investigated a haunted house in which the life-forces of its past inhabitants had been trapped by alien technology, and the Torchwood team found a hospital in which the present and the past were linked, producing the effect of it being haunted. Hide was the tenth episode of the seventh series of Doctor Who produced by BBC Wales. It was the first time Clara Oswald directly communicated with the Doctor's TARDIS and confronted it about not liking her. Clara and the Doctor arrive at the haunted Caliburn House, set alone on a desolate moor. Within its walls, a ghost-hunting professor and a gifted empathic psychic are searching for the Witch of the Well. Her apparition appears throughout the history of the building, but is she really a ghost? And what is chasing her?